(Bucyrus, MO) — Piney River Brewing Company is celebrating their third anniversary on Sat., Mar. 15th at the brewery in Bucyrus. 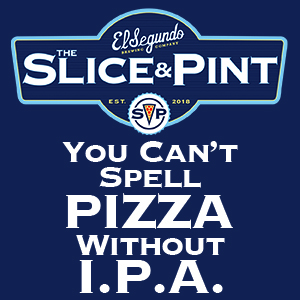 The “3rd Aleiversary” party will be held at the BARn—the brewery and tap room located off Junction ZZ—from 12 to 7 p.m.
“Every year our Aleiversary grows in size and in fun, and we expect this year will be no different” Joleen Durham, co-founder and owner, said. The Piney River tap room will pour several beers that are available year round in the tap room including Float Trip Ale, Black Walnut Wheat, McKinney Eddy Amber Ale, Bronzeback Pale Ale, Old Tom Porter and Missouri Mule India Pale Ale. Special beers will be tapped throughout the day and served as well. 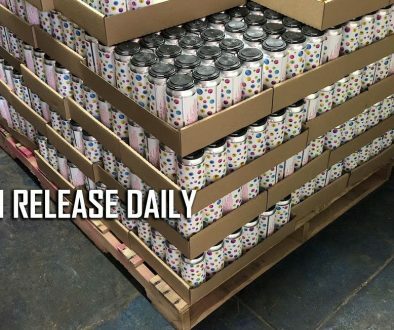 An Aleiversary first at Piney River Brewing will be the release of a beer that will be available on draft and in four-pack pint cans only at the BARn the day of the event. 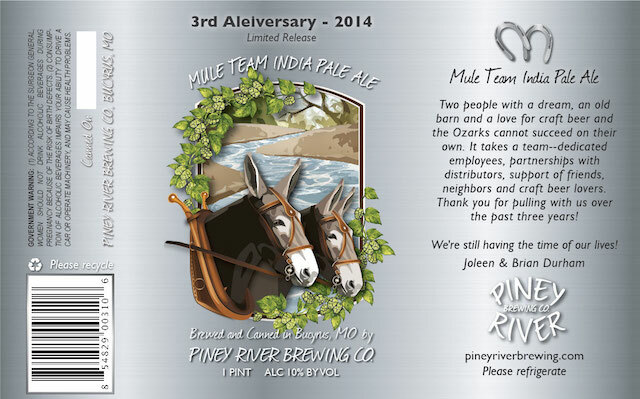 The “3rd Aleiversary Limited Release” Mule Team label thanks the team—“dedicated employees, partnerships with distributors, support of friends, neighbors and craft beer lovers”—that has helped the brewery achieve success over the past three years. “India pale ales are a favorite beer style for Joleen and I, so we thought the style would be an excellent, first time, limited release for Piney River Brewing,” Brian Durham said. In addition to the handcrafted ales, the Aleiversary will feature two bands providing live music—The Farethewells from Salem and Deep Fried Squirrel from Springfield. Both bands feature multi-talented instrumentalists and singers that perform traditional bluegrass tunes as well as Americana, folk and rock covers and original songs. Mike and Julie’s Smoked Meats of Huggins is returning to provide food for the festivities including pulled pork, smoked brisket and “Irish nachos”. Piney River Brewing is located on Durham’s 80-acre farm, operating out of a restored 70-year old barn. 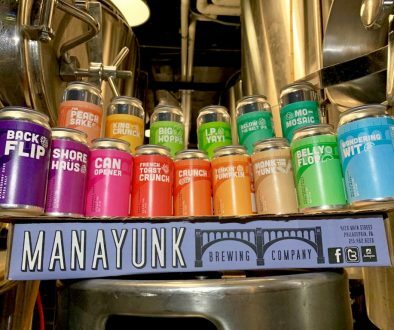 Durham founded the brewery with his wife, Joleen, in 2010 with a 10-gallon brewing system. The seven-barrel brewhouse and related packaging equipment went into full-time use in the fall of 2011. In 2013, Piney River Brewing produced over 1,100 barrels of beer, and their Old Tom Porter won a gold medal in the brown porter category at the Great American Beer Festival in Denver. The brewery has distribution throughout Central and Southwest Missouri and Arkansas. Additional information about Piney River Brewing and the 3rd Aleiversary can be found at www.pineyriverbrewing.com.